Gaya Airport is an international airport in the Indian city of Gaya, with both domestic and international flights in its one terminal. Gaya is the second largest city, the first being Bihar. Many people travel to Gaya as it is a famous place of Buddhist worship. 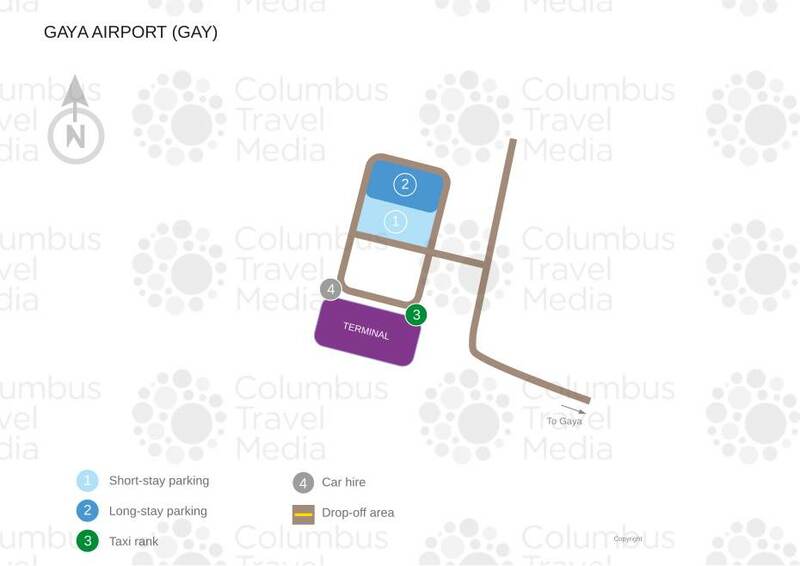 Our Gaya Airport guide contains airport contact details, airport terminal information, transportation options, and hotel recommendations. A tourist information counter can be found within the terminal. From Bodhgaya, National Highway 22 is the best route to take to Gaya Airport. The drive time is approximately 25 minutes. From Gaya, take Nagmatiya Road, heading east toward Patna – Gaya Highway. Turn right onto Patna – Gaya Highway and follow this road before turning right onto Church Road. Continue on Church Road and then follow Gaya – Sherghati to Gaya Airport. The drive time is approximately 20 minutes. Gaya airport is located 12km (7 miles) south-west from the city of Gaya and about 5 km (3 miles) from the holy city of Bodhgaya. There are no ATMs in Gaya airport but a currency exchange desk and banking extension counters can be found within the terminal. Restaurants, bakeries and smaller cafes offering a selection of reasonably priced meals and snacks can be found at Gaya Airport. Duty free shopping is available at Gaya Airport. Other shops at the airport include: bookshops, stationery shops, souvenir shops and a chemist. Gaya Airport has lost-and-found facilities located in the Arrivals hall. Individual airlines also have their own lost luggage counters. Other facilities at Gaya airport include free trolleys, a telephone security hold area, and childcare room facilities. There are no business or conference facilities at Gaya Airport. However, the Hotel Tokyo Vihar (tel: +91 631 220 1141), located 5km (3 miles) from the airport, offers suitable conference facilities. There is free Wi-Fi available throughout the airport, as well as postal services located just outside of the terminal building. Gaya Airport provides wheelchair assistance when necessary. For older passengers, those who are physically challenged and sick travelers, the airport offers assistance on request. At Gaya Airport, there are 200 parking spaces located outside of the terminal. There is one flat rate for vehicles regardless of duration of stay: 35 rupees per car, 50 rupees per bus/coach. A higher rate can be expected for premium parking. There are no car rental service counters at Gaya Airport. However, MyTaxiIndia (tel: +91 888 200 1133) and Clear Car Rental (tel: +91 888 885 5220) offices can be found outside of the airport terminal and can help you with hiring a car.